Dean Lorey is a master of his craft. His workshops are filled with brilliant gems for writers of all mediums, lightly sprinkled with humor and Hollywood gossip. Highly recommended! Dean’s presentations sparkle with his quirky wit and penchant for storytelling. He draws from real world experience in film, television and prose writing creating a uniquely varied perspective for fans and aspiring pros alike. I have several great workshops that I present around the country: Writing for Film, Writing and Publishing your Novel, and The Writer’s Room: Writing for Television. All three workshops are fun, informative and full of great anecdotes from ARRESTED DEVELOPMENT, THOSE WHO CAN’T, FRIDAY THE 13TH, PART 9: JASON GOES TO HELL,MAJOR PAYNE, NIGHTMARE ACADEMY, and more! A fun, one-hour talk about the fundamentals of screenwriting, filled with anecdotes from movies I’ve worked on, like MAJOR PAYNE, HAPPY GILMORE, FRIDAY THE 13TH PART 9: JASON GOES TO HELL, and many more. It’s a breezy, informative session that’s always a sure-fire crowd-pleaser! How do you come up with a great story, write it and publish it? 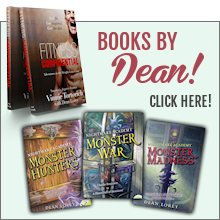 I tell all, using examples from my award-winning NIGHTMARE ACADEMY trilogy (published in over 20 languages) and my current bestseller FITNESS CONFIDENTIAL (with Vinnie Tortorich). Want to self-publish? I’ll show you how! It’s a fun, full hour that leaves audiences eager and excited to write! How do your favorite TV shows get written? I spill the beans in this fun, one-hour session, sharing entertaining stories from award-winning series I’ve worked on like ARRESTED DEVELOPMENT, MY WIFE AND KIDS, THOSE WHO CAN’T, and many more! It’s a great way to learn the ins-and-outs of TV writing, along with how to get your foot in the door! I also have a fun, educational presentation filled with great visuals from my NIGHTMARE ACADEMY series, geared for grades 3rd – 6th. It’s an inspiring talk, designed to get kids excited to read and write. Students will also enjoy many fun behind-the-scenes stories about writing for Hollywood, including movies and TV shows like MY WIFE AND KIDS, MAJOR PAYNE, ARRESTED DEVELOPMENT and many more. I’ve presented this talk at schools all around the country so if you’re interested in availability and rates, please reach out here!